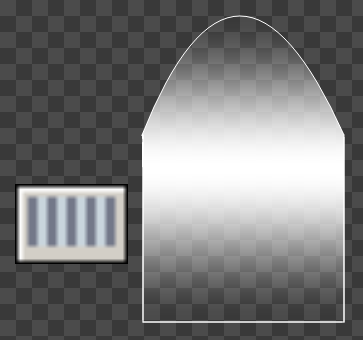 To open this window, check the Opacity Mapping square in the Filling Shape panel, and click on the image which appears below. This window and enables precise definition of the opacity and transparency areas when applying a filled shape. You may draw the spline of your choice on the X and Y axes by placing points at your convenience. Three types of interpolation are available to connect the points with each other: Linear, Spline or Polynomial. In accordance with your settings, a new opacity mapping will be defined. The two red splines define the opacity of each point of the map as indicated in the dotted example. The File popup menu enables saving, loading or resetting the opacity mapping. 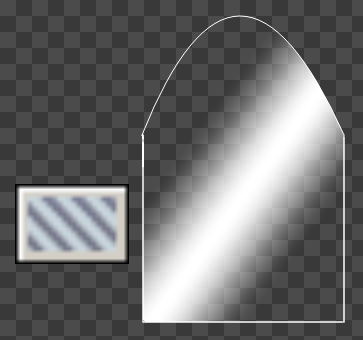 It allows in addition to Add/Remove a custom opacity mapping and Select one from the Bin. 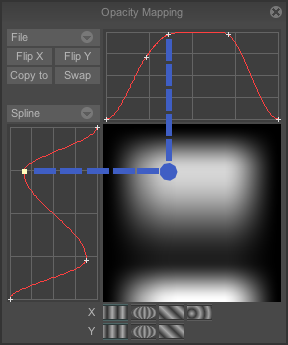 If required, you may swap the two splines corresponding to the X axis and Y axis of the mapping (Swap button) or flip each spline vertically or horizontally (Flip X and Flip Y buttons). The Copy button is used to copy the current spline (the one that has a point selected thus yellow) on the other axis. 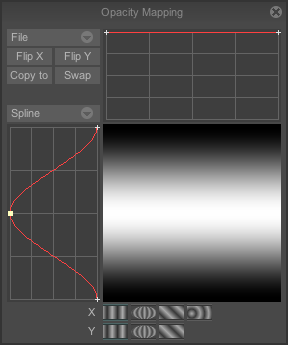 On the image above, the current spline is the Y spline. You may also adjust the mapping by clicking on the image and sliding the mouse. Here again, you have pre-defined parameters at your disposal in the Bin menu. Go to File > Bin and select the pre-defined mapping of your choice. The icons at the bottom of the window have a special function. 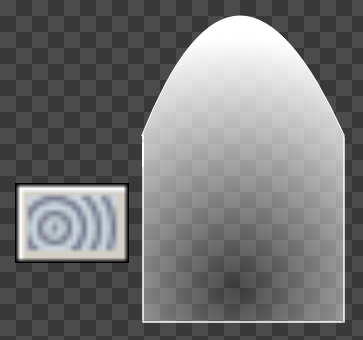 They enable you to choose how the opacity mapping will be applied in the filled shape you will draw. 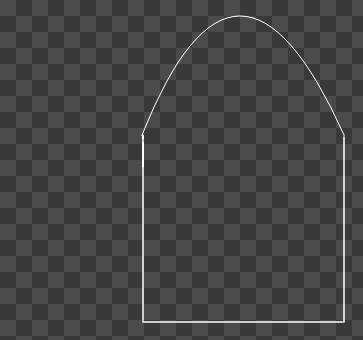 Let's take for example the opacity mapping (left) in order to floodfill a shape created using the spline tool (see below). For case (3), you must draw a vector on the screen, as you have done for drawing a gradient. 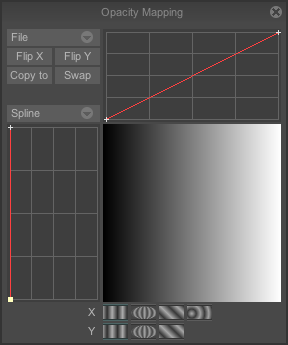 For the fourth option, modify the X spline as shown in the example opposite. For case (4), you must draw a vector on the screen. Note that the option on the Y axis is disabled. The Gradients and Opacity mapping functions combined for use in a layer are very useful for creating effects of lighting or transparency independent of the background color or scenery (as they are not part of it). 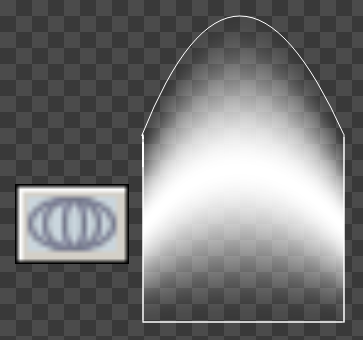 Above, the opacity gradients were used on a layer to create car headlights. They must no longer be modified when the background color changes, which results in considerable time saving.